Various Solid Mylar Foil & Latex Balloons. What's a party without balloons? They're the most common and easiest form of party decor and party hosts are still finding all sorts of new and innovative ways to incorporate them into the party theme. Mylar foil balloons often feature high detail and work well as large decorative pieces. Traditional latex balloons can be used for a whole array of party ideas from games and indoor/outdoor balloon pits ro simple party handouts and party favors, to adding additional flair to the party decor theme. 1SuperParty’s wide assortment of balloons are available in either mylar foil or latex. 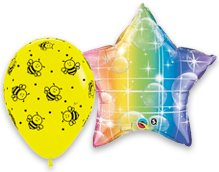 Both materials can be inflated with either regular air or, if you want them to float, helium. Balloons filled with helium are expected to stay afloat for about a week. Here, you’ll find our variety of party balloons from our different theme categories organized by material. Shop our online collection for theme character balloons from Disney, Marvel, DC Comics, Star Wars, or safari animals, birthday theme balloons, and miscellaneous designs. 1SuperParty sells foil balloons and latex party character balloons at wholesale prices. Join in the festivities and shop for your next birthday blowout or party celebration at 1SuperParty. We're your #1 balloon warehouse for cheap balloons, wholesale balloons, and bulk balloons for cheap!